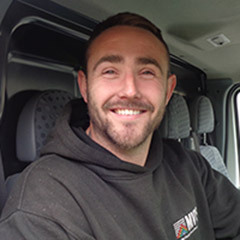 Darren was recently promoted to North Delivery Supervisor and is responsible for keeping our promises to our customers; making sure the right equipment is on time to the right locations according to their needs. He spends most days on the road, travelling up and down the country and is also responsible for maintaining the signs we hold on site. Darren is extremely proud of his team and the work they do to keep our customers happy. A family man, he also gets huge satisfaction from the knowledge that the signs and equipment MVIS supplies actively contributes to keeping the road network safe.